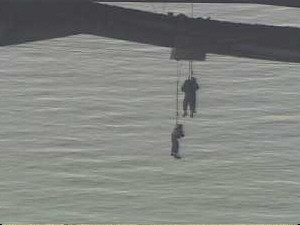 One worker who was trying to rescue his three friends is missing after falling into Mississippi! A painter working beneath the Jefferson Barracks Bridge fell into the Mississippi River while trying to rescue three co-workers who dangled on tether lines from a collapsed work platform. A St. Louis fireboat and three small tugboats searched the Mississippi southward to the Meramec River. Mehlville Fire Protection District officials said workers last saw him several hundred feet downstream from the bridge. The collapse occurred about 11:30 a.m. today, said Mehlville Fire Chief Jim Silvernail. He said it took about an hour for firefighters to pull the three dangling painters to safety. After their scaffolding collapses leaving three men dangling from safety harnesses for an hour. Mehlville Fire Department Chief Jim Silvernail says the worker who fell into the water was seen near a barge, but the worker was still missing. Boats and helicopters were searching for that worker. At the same time, rescuers were trying to free 3 workers who were suspended from the bridge in harness equipment. The first two were pulled to safety by noon, and the third was rescued just a few minutes after noon Friday afternoon. accidents since 1994. In both cases, men who fell during bridge work died and their safety equipment was questioned. The Jefferson Barracks bridge crosses the Mississippi on Interstate 255, near the intersection of I-270, I-55 and I-255 south of St. Louis. Traffic was stopped during the rescue efforts. Anyone who is familiar with barges knows that it is very dangerous to be in the water near them. 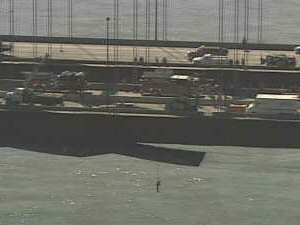 Rescuers were still looking for the worker as of 3:30 PM CST. Update: (7:00 PM CST) The painter, Jimmy Belfield, is still missing. Please remember his family and friends in your thoughts and prayers.